BOTTOM LINE: A brief but intelligent exploration of celebrity in our society. 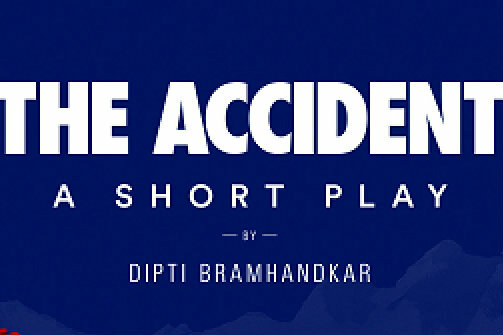 Dipti Bramhandkar’s The Accident is subtitled as “a short play.” However, it explores large themes and asks very complex questions in its compact running time of 45 minutes. The play tells the story of a man referred to as “He” (played by the handsome Bobby Rodriguez). He has become a national celebrity after falling from a cliff in an attempt to rescue two fellow hikers. After sustaining massive injuries and enduring a two year rehabilitation period, he has started a foundation to assist people recovering from traumatic injuries and released a memoir which cements his heroic reputation. However, questions about the validity of his story begin to surface -- it’s reported that he had been drinking on the night of his fall, and that the bodies of the climbers he was allegedly trying to save were already in rigor mortis by the time the helicopter came to rescue him. Bramhandkar structures her play like a mosaic documentary. We hear from multiple people in He’s life: His Physical Therapist (Robert Montana), a Journalist investigating his story (Diogo Martins), an adoring Fan (Cara Yeates) and his disapproving Baba (Rahoul Roy). Each of the actors give honest and believable performances. There is not a weak link among them. The Accident poses some challenging questions about the nature of celebrity, and whether we should condemn someone’s fall from grace if they’ve brought good into the world. I think the playwright has a solid groundwork. As it is now, the play is intelligent, challenging, and hilarious. I think it could easily be expanded to encompass the perspectives of many other people in He’s life. I would like to have seen him interact with more of his family -- we only get to hear from his father. Additionally, I felt the play petered out in the end. We hear of a lawsuit that He presses against the Journalist, but we don’t get to see this event play out. Obviously, this would require a longer running time and possibly a larger cast, but I would definitely sit through another 45 minutes of this play if it meant Branhandkar could explore the theme of dubious celebrity on a larger scale.